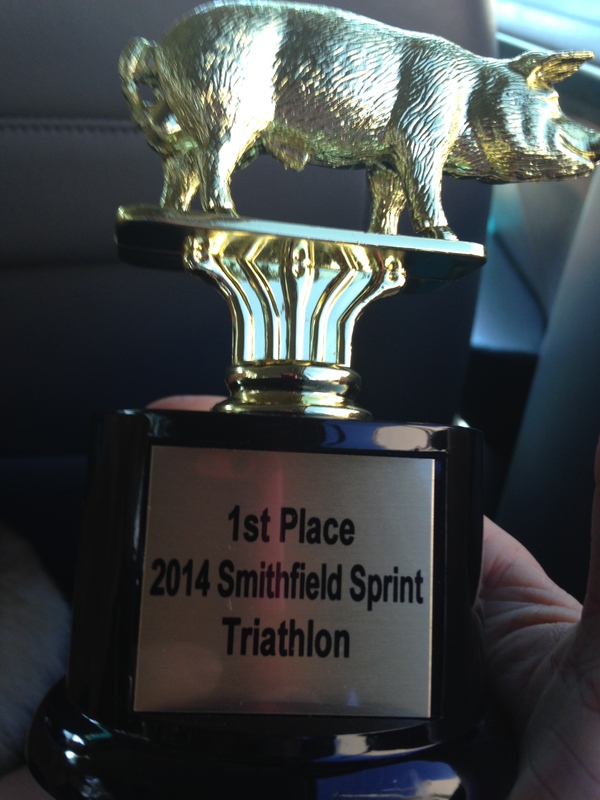 It was a beautiful day for a triathlon, 70 degrees and sunny. Once again Setup Events put on an awesome and very well organized event held at The Luter Family YMCA in Smithfield, VA…300m pool swim, 10-mile bike, and 5k run. It was a late start race, 10am, so we drove down the morning of from Stafford. For 569 participants to embark upon a small town YMCA, you would think that the parking and traffic would be a nightmare, but not-at-all. We arrived at 9:00am and parked right across the street from the Y. Seriously… Setup Events has event organization down to a tee. I met up with my Training Partner, Jesse Mastrom (TriFitJesse), picked up my packet, and setup my transition area all within 30 minutes. My swim time was at 11:05am, so I had just over an hour before my start. Tossed down a pack of Power Bar Energy Blasts about 15-minutes before the swim. 0:50 – 1:20 : Super Fast: In contention to win the race and you swim competitively. 1:46 – 2:10 : Average Swimmer: Swim well enough and don’t need to stop at the end of each lane. 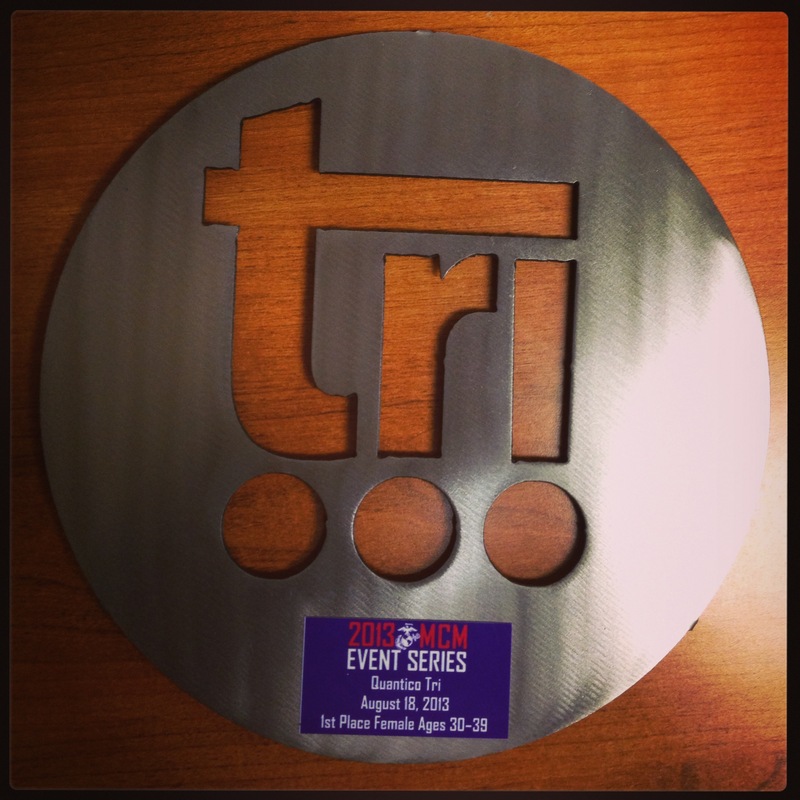 2:11 – 2:44 : Novice: Still getting used to this thing called triathlon. 2:45 – 4:59 : Complete beginner: I want to start at the back. Swimmers enter the water one-by-one, in order of bib #, and begin swimming every 10-15 seconds. After each set of 40 swimmers there is a break to clear the lanes. 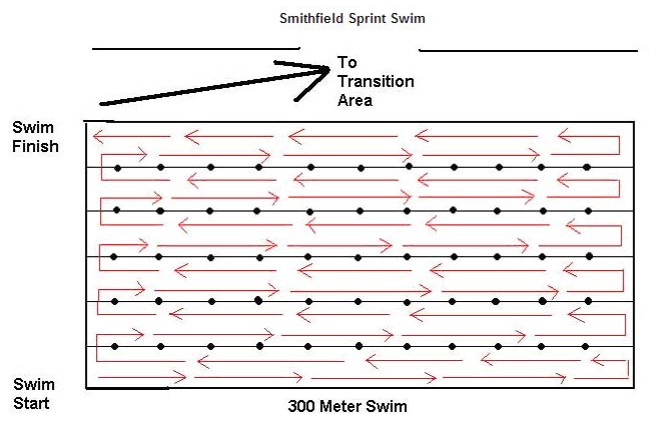 The swim is done in a snake pattern through the lanes and passing is allowed but can be tricky. If you are fast enough to catch the person in front of you, gently tap their feet to communicate that you want to pass. You’ll need to pass on left, but being cautious of the swimmer coming the other way. My dislike about a pool swim is that there are those that believe they swim much faster than they actually do. I was #224. The person in front of me and behind me chose wisely, however I found myself having to pass two people during the swim and catching up with the feet of a third at the end. Your swim order, and the swim time selected by those around you can greatly affect your swim time, which in-turn affects your overall swim time. Swim Time: 05:32. Hopped out of the pool and ran to the transition area, on the wrong side of the racks, went under the bar, shoes, sunglasses, helmet, out. That was it. T1 Time: 01:12. Ran out of transition, hit lap on my Garmin 910xt, jumped on the bike, and then realized that my Garmin was in swim mode…WHAT?!?! For a girl who needs to know what her numbers are, this was not going to work. It definitely hurt my time on the bike when I slowed a bit to switch to bike mode. This was a quick 10-mile course with small rollers. During the pre-race meeting, the event organizers note a steep incline after the sharp left turn onto Bethany Church, which is not quite as steep as made out to be. I pushed through the course, averaging around 20mph. A BIG mistake, however, was underestimating the need for water on the bike since it was only 10 miles. The air was dry and so was I. I took a Power Bar Energy Gel at mile 5 which also helped to soothe my dry throat. Bike time: 30:58. My T2 was not as smooth as T1, which was not smooth either. I had too much going on. Normally it would be shoes, visor, and run out of transition with race belt in hand. However, I needed to drink some water and adjust the mode on my Garmin, adding about 15-30 seconds. Not to mention that my bib ripped on one side, so I ran the course with my number hanging. T1 time: 1:34. The run was good, not great, but good. My legs felt loose, which I’m attributing to keeping a higher cadence on the bike (90-95), so that was good, but I really believe that I could’ve pushed harder. I wouldn’t call the course hilly, I would say rolling since there aren’t really any big climbs. The run was an out and back 5k, closed to traffic, and through a few neighborhoods. The locals are awesome and cheered as we ran past. Run time: 24:41. Setup Events always puts on great events, I have never been disappointed. I was looking for a short and fast, early-season tri to work out the kinks, and I found it. It was a diverse group of participants too, including youth, collegiate, competitive age groupers, and first-timers. I placed 1st in my age group and I will definitely be back next year to PR the course. Ripped my bib coming out of T2. Yep, I ran like that. 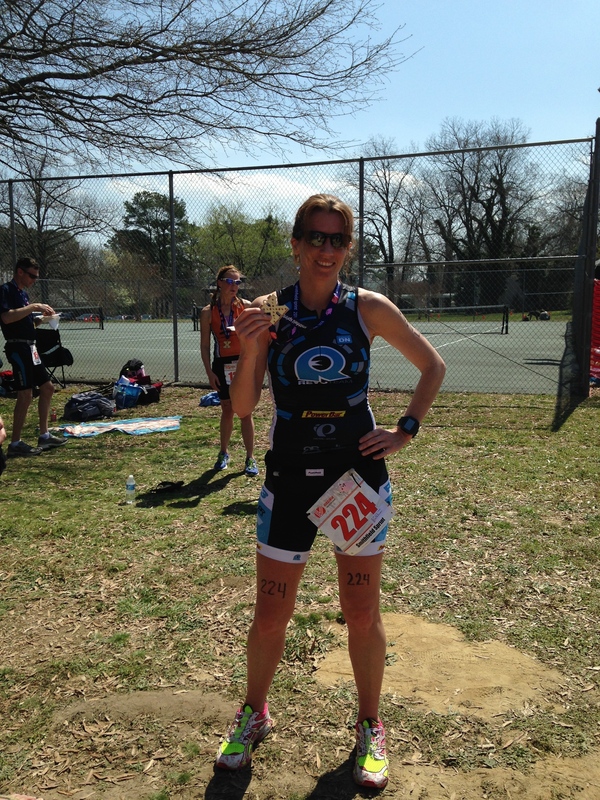 This entry was posted in Triathlon and tagged bike, PBTE, PowerBar, Quintana Roo, race, race report, run, setup events, Smithfield, sprint, super sprint, swim, triathlete, triathlon on April 25, 2014 by usmctriwife. Surprise…surprise, rain was in the forecast. Once again Mother Nature has blessed me with a rainy day to compete in. Not only was it raining, it was cold. It was cold in August! What the heck?! However, regardless of the weather I had an awesome experience. It was quick and it was fun. For an inaugural race, it went off without a hitch. Hanging out with my daughter before the race. There wasn’t much pre-race for me for this race since it was right down the road from me on Marine Corps Base Quantico. Luckily, I train on these roads and in this pool all the time, so I knew the course well. This was my first-ever pool swim triathlon, and I was very unclear as to how the swim was organized. Thank you Set Up Events for providing us with clear pre-race instruction. The swim was only 400 yards, setup in 25-yard lap wide lanes for triathletes to serpentine through. Up and back in the first lane, under the rope, and then repeat. Athletes were numbered by the time they estimated during their registration. I overestimated my swim finish time by over a minute, so I had to pass a few people. Transition was setup in the parking lot just outside the gates of the pool. Transition was quick and easy. Once again I’m riding in the rain. However I know this course well, these are my training grounds. 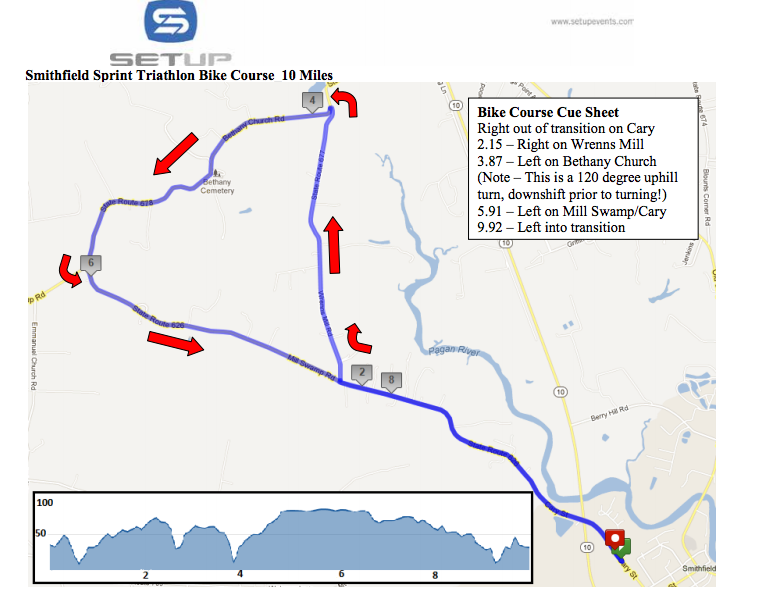 The bike course has a few short hills and some small rollers, but for the most part it’s a fast 9-mile course. The roads are a bit rough and bumpy, with a few holes, which were well marked by the Marine Marathon staff. The 5k-run course was mostly flat with a lot of puddles. There go my semi-dry shoes. I had a comfortable run. Flew by the aid station at mile 1, no need, I think I got enough rainwater anyway. With a woman from my age group on my tails, just seconds behind me, I ran hard through the finish line. As with all of my races this year was rainy, but a lot of fun. For an inaugural race, Marine Marathon with the help of Setup Events did a fantastic job! Regardless of the weather, the volunteers were out there with smiles on their faces. Placed 1st in my age group. 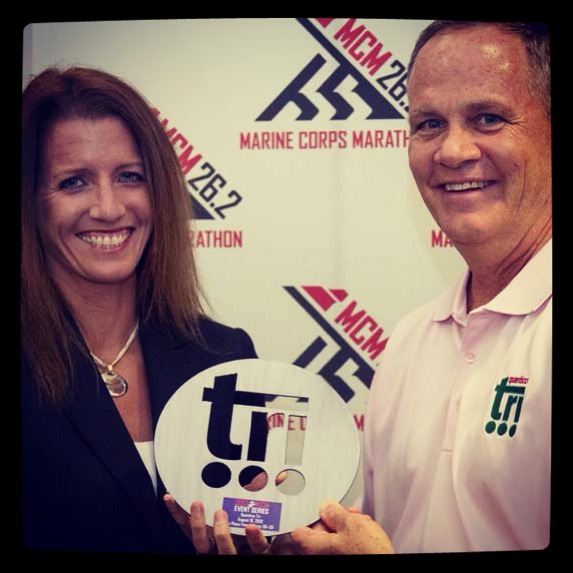 This entry was posted in Uncategorized and tagged Marine Marathon, Quantico, setup events, triathlon, USAT on October 8, 2013 by usmctriwife. Once again Set Up Events provides me with a race that close enough for me to drive to the morning of. I was able to get an excellent night’s sleep the night before, 7 hours. The race didn’t start until 8am so I was able to wake up at 4:30am and leave at 5:30am. Same routine as every other race morning, two pieces of toast and a cup of coffee with a bottle of water on the way to the race. 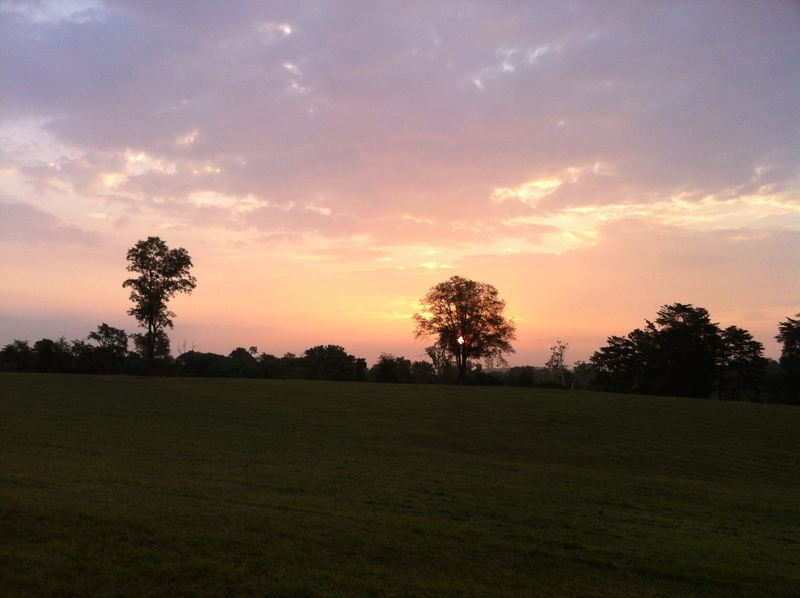 The Culpeper race site was good, but not great. Mountain Run Lake Park is beautiful and the parking was great, but the NO SWIMMING signs posted around the lake were a bit of a turn off. Haha… I guess triathletes will swim anywhere. The terrain was a bit difficult to navigate too when you are pushing a bike as well as lugging a pack full of gear. There is a short, but steep hill to walk down from the parking area to transition and check-in. Although the terrain is not optimal, Set Up Events did the best they could with the area they had. Check-in and packet pick-up was done smoothly and quickly, just something to be expected by Set Up Events. Nice swag too, bag full of trial goodies, t-shirt, and Culpeper Tri socks. The transition area was a grassy area set up by race number and there was plenty of room for each person to have their own space. I was very happy with the room I had to set up. The bike course is across hilly, country roads and the run is hilly and in residential areas so there aren’t many places for spectators to view the racers during much of the course without sitting on someone’s lawn. The swim, oh my, the swim. Be careful when you enter the water here, the shore is rocky and after you get past the rocky you get into the squishy. Let’s just say that I was happy to not see what my feet were planted in. Ewww. The water temp was a toasty, NO WETSUITS. The swim course was marked well, counter-clockwise, but could have posed some issues if you’re not sighting. No worry about currents here. It was in in-water start, so remember what I said about he lake bottom, it was either tread water or let my feet sink into the goop and not move. I started in the front left of the group and immediately got into a great breathing rhythm. I felt really good about my swim as I passed up a lot of the wave in front of me, 39 & under + military men. Yeah, I was rockin’ it. I was 4th out of the water in my wave. My Ultra Speedzoot was on again, easy on, easy off, and a smooth glide through the water. What I would do differently? I made sure to be extra careful getting out of the water because of the rocky shore. The run to the transition area was not very far, I should have run a little harder. No sand on my feet to rinse off. Slid the speed suit off and my bike equipment on. The run to the bike mount area is a steep, grassy hill. I ran with my bike shoes on, but I think that I would do better to practice getting on the bike with the shoes on the bike. Not much. Overall my T1 time wasn’t too bad, but running with shoes off may have helped. My setup in T1 works well and I got my gear on quickly. The bike course was good, but with some potholes and rough surface. The local law enforcement controlled the traffic very well, but once again I did not like that the roads were open to traffic. Some passing cars were not exactly cyclist friendly and driving over the speed limit seems to be the norm. It made it difficult to pass having to pay attention to upcoming vehicles. This is a hilly ride, notice the emphasis on the word hilly. I think I could have pushed it a little harder on the bike. I had a Gu towards the end of the bike to kick in for the run. The 5th fastest bike split isn’t too bad, but certainly could have been better. I moved pretty quickly through T2. I have a good setup and got my gear on quickly. But, I dropped my Gu. The run course was hot, hilly, and hot. Starting out you have to run up a steep, grassy hill to get to the main course. 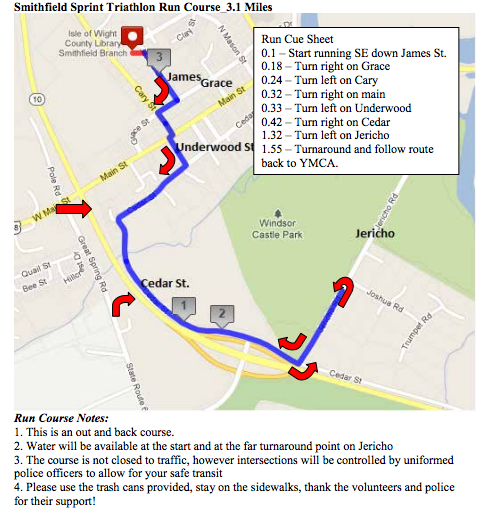 The course is 2 laps through a residential area. Local law enforcement handled the local traffic very well and there were a lot of awesome volunteers. There were 3 water stations set up at each mile, but no porta-potties. Once again I started to get a cramp in my side and my legs felt like bricks. I blame this on not enough salt the night before and not enough bricks in my training. I wasn’t the only one that was moving slowly though, there were more than a few that were having problems due to the heat. I will definitely make sure to take in more salt and water before to avoid cramps during the run. I’m also going to try some more stretching which may help with my legs feeling so heavy going into the run. More brick workouts in my training will also help. Once again Set Up Events has put on an awesome race. Registration, packet pick-up, timing, volunteers, through posting the results, all done smoothly. I would suggest a porta-potty be added to the run course for those just in case moments. Although I did not like the hill climb from transition to the bike and the run, overall I give this race an A. 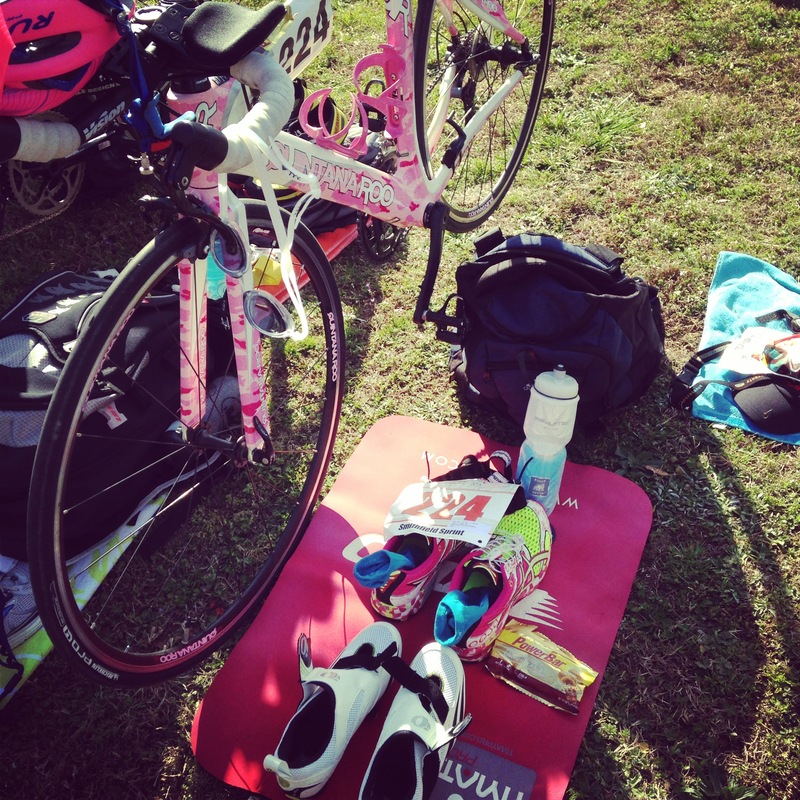 This entry was posted in Triathlon and tagged culpeper, setup events, triathlon on September 8, 2012 by usmctriwife.